The final version should consist of a Dash but I cant gaurantee a dash,Another paint and maybe a few tex improvements. 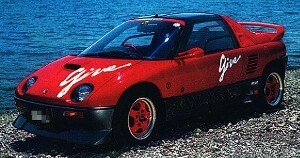 1992 Mazda AZ-1 with GIVE bodykit. Cool, I've never even heard of Dome, or the Zero, were they sold in the US? Have you got any newer pics than this one? I'm not gonna wait 2 minutes for your sig to load, just to see your car all blurry and crap. They were orignally jpegs and were the only I could find so I had to work with them most of it is orignal but lots of it has been redrawn and stuff. Hey sorry to bring back this post from the dead but I've been trying to dig up some of my old 3d models, does anyone have the .ar for this car lying around? I'd love to have it!